Nvidia already confirmed it's hard at work on a brand new gaming device, so it's no surprise that the rumor mill is spinning up. The latest development in the saga of the alleged Nvidia Shield tablet - a slate-shaped successor to the Nvidia Shield gaming handheld - is the photo you see below. The image comes by way of Evleaks, which at this point requires no introduction as the source of countless legitimate leaks. The alleged snapshot of the rumored tablet was accompanied by a brief caption that leaves no room for ambiguity: "NVIDIA Shield Tablet, 2014." The Nvidia Shield tablet is thought to be an Android tablet running Nvidia's powerful Tegra K1 chip, with a focus on gaming and the ability to stream PC games from computers with recent Nvidia GPUs. The original leak from May came in the form of a benchmark that pegged an unknown Nvidia tablet with a 7.9-inch 2048 x 1536 display and the 2.1GHz quad-core Tegra K1. More recently, Nvidia confirmed it has a new gaming device in the works, and sources said it would take on Valve's Steam Machines, like the Alienware Alpha, directly. That report may or may not have referred to the Shield tablet, but let's assume for the sake of speculation that it did. This means a focus on gaming in the living room, and the Shield tablet's rumored specs seem to support that. Like the original Shield, the new tablet is rumored to be packing HDMI-out capabilities. However unlike the first Shield, the Shield tablet's controller will supposedly be sold separately. 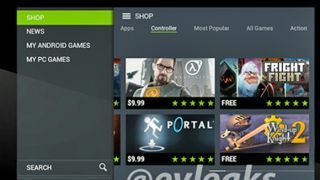 Could the Nvidia Shield tablet be a one-stop slate for Android touch screen gaming, portable PC gaming, and living-room gaming with a controller in hand? Hopefully Nvidia breaks the silence soon and lets us know.